If you have more than one computer, a KVM (Keyboard/Video/Mouse) is an essential device, allowing you to instantly switch between computers from a single display and keyboard/mouse setup. Unfortunately, a lot of consumer-grade KVMs haven’t kept up with current technology. Walk into your local computer superstore and you’ll find lots of VGA switchers, but rarely DVI switchers needed for today’s digital displays. The few inexpensive DVI switchers available often don’t support the higher resolutions of modern, large-sized flat displays. Gefen’s ex.tend.it 2×1 DVI KVM switcher is a rare exception, and its design and reliability could make it the only KVM you should ever consider. At US$199, it’s a product that’s finally in the reach of the average computer user. I’ve been testing it rigorously here on a Mac/PC setup, and I like what I see. Video: This model supports only up to a 1920 x 1200 (or 1080p and slightly above) resolution, not the higher resolution used by ultra-big displays like the Apple 30″ Cinema Display, but it was fine for my 23″ display. Note that you don’t have to have two desktop computers, as I do, to make a KVM setup useful. 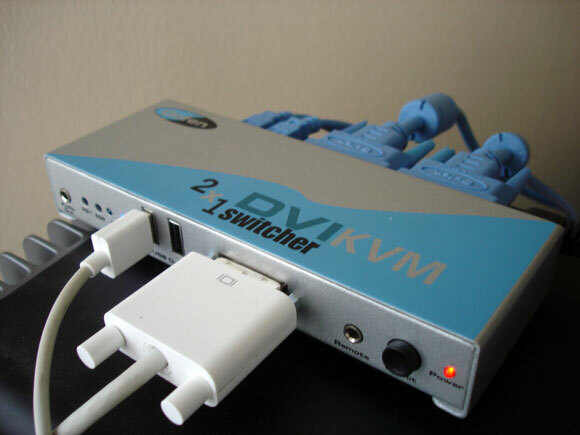 As long as your laptop supports DVI output (as all recent Mac laptops and some PCs do), you can use the KVM to switch between your laptop and desktop machine. USB:Anything plugged into the hub will now be accessible by both machines. Audio: I chose not to connect audio, because like most musicians I connect my setup to a mixer first and I use external audio hardware, not the internal audio outputs on the computer. The audio switching works, though, should you need it. Gefen’s KVM is simple: press a mechanical button on the faceplate of the unit and switch USB, DVI, and audio from one computer to the other. 1. Let each machine boot up entirely before switching. Your computer typically needs to be actively connected to the display to recognize it. (I found this was especially true on the PC.) Boot up the first computer with the KVM switched on, then switch to the other computer and boot it up. Wake from sleep generally works fine once you’ve done this, so this is only an issue at initial boot or reboot. 2. You’ll need to make an adjustment to your DVI cable before use with a Mac. Apple in their infinite wisdom breaks with the DVI specification in the way the hot detect pin is set on the DVI cable itself, as detailed in a Gefen FAQ. Pin 16 is set to “low” on Apple computers; it should be “high” according to the DVI spec. Sure enough, without making the modification my Mac would sometimes spontaneously shut down during switching. Users have also reported other symptoms, like intermittent blinking. Pin 16 is easy to spot (1), as it’s centered underneath that longer, flat piece on the DVD-D cable included with the switcher (2). With pin 16 out, the Mac worked perfectly. Ergonomics and space: While it’s possible to put displays next to one another or use a laptop on your desk next to a desktop, I find it’s easiest ergonomically to locate a good-quality keyboard, mouse, and display in one, convenient location. This is all the more true here in Manhattan with limited space. Dedicated machines for cross-platform use: Sure, dual-booting and parallel operating systems are all the rage these days, but to me, nothing beats having dedicated machines for the task. I’m able to switch between the Adobe Production Suite, which I’m running on the PC, with the Apple software running on my Mac. Rendering: Finally, I can leave one machine rendering or working on some other task while I continue working on the other machine. Road rig, home rig: For live visuals, it’s great to be able to “dock” my road/performance machine with the KVM and switch back to my studio-only machine. On-the-road switching: We’d be remiss on this site if we didn’t mention the usefulness of switchers in interactive visual installations and live performance rigs, any time you need to operate with DVI projectors and high resolutions. I didn’t get a chance to use this application, as I usually project at VGA as a maximum configuration for those kinds of projects, but it’s comforting to know this gadget is in my studio should I need it. My only complaints, in fact, seem to come from my Windows computer and not the KVM. There’s a significant delay of several seconds on Windows XP while the computer sets up USB devices like the mouse and keyboard. (The Mac responds almost immediately.) I’ve occasionally been unable to wake the PC from hibernate mode using the switcher, but I can add this to my long list of complaints about XP’s buggy hibernation support. All in all, this to me is the perfect KVM at the ideal price. If you don’t like booting up the machines separately, Gefen makes a separate DVI Detective accessory that solves the problem, and the accessories page lists various remotes if you need your display to be in a different location than the switcher, whether to cover a few feet or to separate your monitor, keyboard, and mouse from the CPU entirely, as in an audio production studio. I’m definitely keeping this KVM, and I’ll be looking at Gefen’s products for more advanced matrices and switching should I get lucky enough to be configuring multi-DVI or VGA projector setups. As always, we’re happy to hear your thoughts on KVMs and other accessories, and will be glad to ask questions. Hit comments, or head over to the Create Digital Motion forums. In the meantime, this product definitely gets our “recommended” label.